It's no secret that puppies sold in pet stores often come from cruel puppy mills - but this week a former pet store employee shocked everyone at a local meeting with her descriptions of the horrific conditions she saw behind the scenes in her own workplace. Rylee Barr, a former employee at a Petland in Sarasota, Florida, worked at the store for a year before she became a kennel staff member and saw what was really going on. Barr described the store's new puppy deliveries: "Five or six dogs would be in one crate and they would all have a form of kennel cough," she told the Herald Tribune, "Honestly, there were no healthy dogs ... Just dogs that were less sick than the other ones." She saw ill dogs ignored in crates in the back of the store - left to suffer instead of getting the medical care they needed. "There was a puppy that was dying because she had not been eating, and I had told them on multiple occasions she had arrived there and wasn't eating. I said 'someone needs to take her to the vet,'" Barr told Sarasota's ABC7 news. It wasn't until one of the puppies died in her arms as she held him that Barr finally reached her breaking point. After that, she said, she quit. Barr said she felt compelled to speak up for the puppies. "Someone has to give them a voice because otherwise they will be stuck behind that window," she told local outlet Fox13 news. Barr, along with other local critics of puppy sales in pet shops, were gathered for a Sarasota County board meeting to decide whether it would join other counties across the country in banning puppy mills. One woman who testified at the meeting described the devastating health problems her puppies had after she purchased them from a pet store. Sadly, her story is not uncommon - many pet store puppies suffer from contagious diseases like parvovirus, distemper and kennel cough. Geniene Arnold of Wappinger Falls, New York, experienced firsthand the health problems that afflict so many pet store puppies. She paid $899 for her puppy, Muffin, who came from a pet store. But when she took Muffin home, she realized there was something very wrong with her new pup. Muffin was suffering from severe diarrhea and had to be rushed to an animal hospital after losing blood - where she was diagnosed with parvovirus. After some touch-and-go days at the hospital, Muffin pulled through - but not before racking up a $9,473 vet bill. She probably contracted the illness at some point on her journey from the Missouri puppy mill where she was bred to the New York pet store where she was sold. Back in August, Phoenix, Arizona, became one of the latest U.S. cities to require that pet stores sell only rescue dogs and cats. Advocates in Sarasota County hope their hometown will follow suit, but the meeting was just a preliminary one, giving locals a chance to voice their opinion about the issue's importance. The room was packed - and the board voted 4-1 to hold a public hearing about a puppy mill ban. The hearing has been scheduled for January. Barr's former employers at Petland unsurprisingly disagree with her accounts of working at the pet shop - one current employee told Fox13 news that the pet store was "like daycare," saying "they are going to get a cold, but we don't have dead, dying dogs here." Pet stores that sell puppies are like daycare ... if all the babies were for sale to the highest bidder. 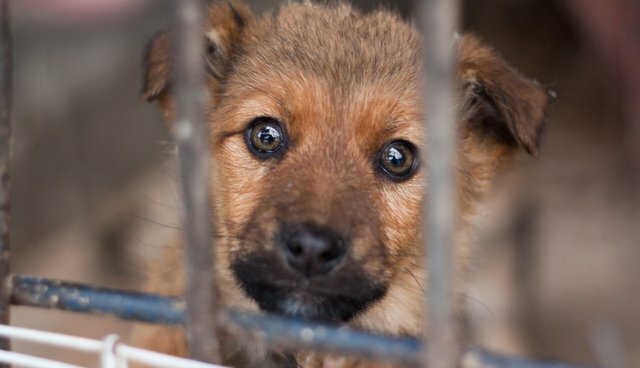 Find out how you can join the fight against puppy mills here.